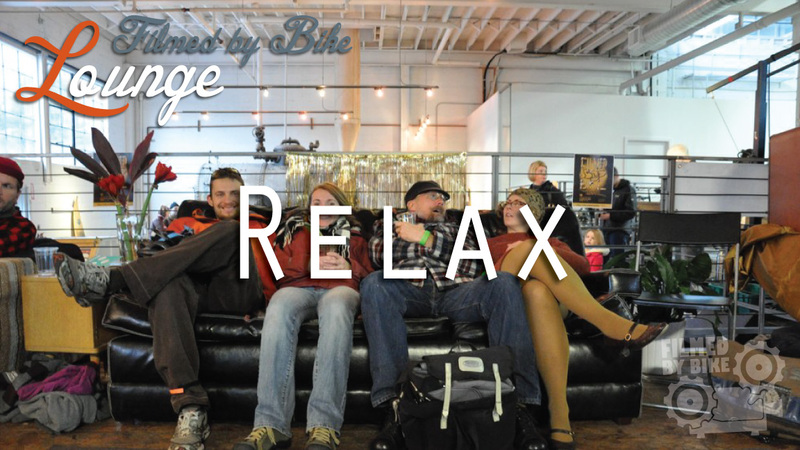 Hang out with us in the Filmed by Bike Lounge at BikeCraft. We’ve created an oasis of relaxation with comfy couches and bike movies playing on the screen. Grab a beer, lunch and fresh popcorn from Pedal Kettle while you take a break from all the handmade magic of BikeCraft. Are you a filmmaker working on a movie? Our staff will be in the lounge to answer your questions and help you finalize your movie. We’ll be unveiling our brand new poster, designed by Matt Cardinal and printed by the luscious printing experts at Stumptown Printers. We will have copies of our brand new accompanying sticker. You can get a free poster when you purchase any of our DVDs. Stop by the PDX by Bike Concierge Desk to ask questions about commuting, shopping and generally exploring the city by bike. The PDX by Bike Ambassadors will be on hand to meet one-on-one with you. Watch bike movies all year long with all your friends! We’re selling our DVDs at special gift pack prices for BikeCraft. Pick up a tall stack and give gifts to all your friends this holiday season. What we do here is large, not small, and quite an undertaking for our team. If we find the means to make it happen, we have a few places on our list of where we might go. The demand has been there for many years now so the list is growing!